An $LC$ circuit containing a 2.00-H inductor oscillates at such a frequency that it radiates at a 1.00-m wavelength. (a) What is the capacitance of the circuit? (b) What is unreasonable about this result? (c) Which assumptions are unreasonable or inconsistent? This is an unreasonably small capacitance. Either wavelength is too small or inductance is too large. This is College Physics Answers with Shaun Dychko. An LC circuit emits an electromagnetic wave with a given wavelength of one meter. Now we can figure out what the frequency is by saying that the wave equation for electromagnetic waves is the speed of light equals frequency times wavelength and we can solve for f by dividing both sides by Lambda . And so we have this expression for f c over Lambda and we can have another expression for f for an LC circuit, which is that the resonant frequency is one over two Pie times square root of inductance times capacitance. And then since these are both equal to the frequency, we can equate them together. 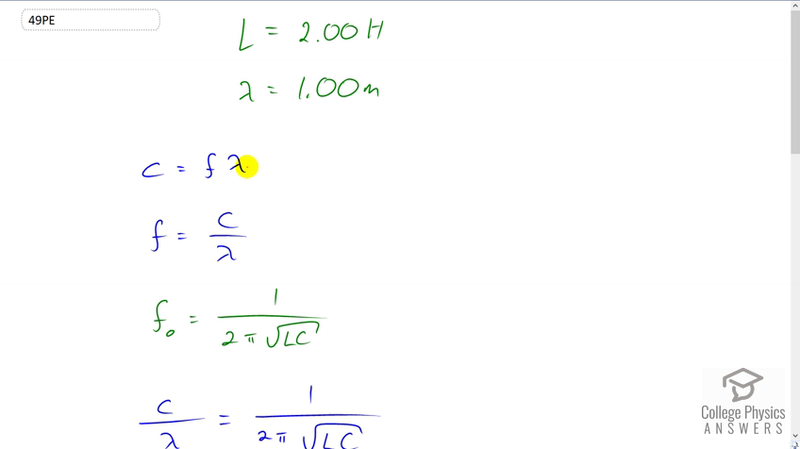 And that is c over Lambda equals one over two Pie times square root LC and now we Square both sides now, by the way, it didn't say resonant frequency in this question here, but it doesn't need to say that because since there's no resistance. It's going to have to oscillate at its resonant frequency, which is this formula here. So we Square both sides and we get c squared over Lambda squared equals one over four Pie squared times LC and we'll solve for most be a bit confusing because we have an unusual equation with the letter Capital C representing capacitance and lowercase c representing speed of light so we'll have to try and keep those straight. So we're going to multiply by capacitance divided by and also multiplying by Lambda squared and then divide both sides by little c squared. So we have capacitance is wave length squared over four Pie times inductance times speed of light squared. So that's one meter squared divided by four Pie squared times to Henry's of inductance times three times ten to the eight meters per second speed of light squared which gives a capacitance of 1.41 times ten to the minus 19 farads. This is an unreasonably small capacitance. And so either the wavelength is too small or the inductances too large because here's our formula here and this formula given the numbers we have is making a result that is too small. And so to increase this fraction, we can either decrease the denominator and so the inductance it was too large. So it should be smaller or we can increase the wavelength and so the wavelength was too small that was given to us and so it's actually should be larger.